Mrs. Farzana Shahid is the Director Academics at Information Technology University. Prior to her appointment at ITU, Mrs. Farzana Shahid was the Registrar at Beaconhouse National University for 10 years. She has the singular privilege of being the first lady registrar in any university of Pakistan at that time. 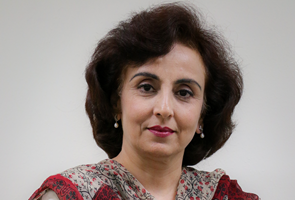 She is an accomplished and experienced educationist with almost three decades of educational leadership experience under her belt from different prestigious institutions in Pakistan, including Army Public Schools & Colleges, The Beaconhouse School System, The City School Network and Asia Pacific Institute of Information Technology (APIIT). Mrs. Farzana Shahid has postgraduate degrees in Advanced Professional Studies from the University of Strathclyde – Glasgow, Postgraduate Diplomas from the University of Bradford, and a Master’s degree in Anthropology from the Quaid-e-Azam University, Islamabad. She has had a distinguished academic record with top positions in all her undertakings from matriculation to the Master’s level. She has been the recipient of the President of Pakistan’s Award for the “Most Talented Student” for three years in a row from 1977-79 and has won an impressive total of 29 gold medals for her accomplishments as a debater. Mrs. Farzana Shahid was awarded the Farogh-e-Taleem Award by the Government of Punjab for 4 consecutive years for her outstanding performance in the field of Education. She was also named the “Best Teacher” and “Most Outstanding Principal” throughout her career at the Beaconhouse School System and the City School Network.